Riga is a city of hidden corners – a once very prosperous and dynamic trading city that has struggled to regain its former importance and wealth. It has been shaped by the many different countries and rulers Latvia has been under over the years – built by German crusaders, a greatly important city under imperial Sweden and Russia, Riga has also been the capital of a Soviet republic and in the ’20s and ’30s, and again since ’91, the capital of an independent nation. All have left traces, but many are now hard to detect on the surface. And for the last few years, the best place to discover these traces has been the Paslēptā Rīga (Hidden Riga) Facebook page, curated by photographer and architect Zigmārs Jauja. Jauja posts images from secret courtyards, ornate details in decaying doorways and floral patterns on long-forgotten tiles – most taken in the very heart of the city, but from places that tourists never get to see. With over 14,000 likes so far, it’s found a sizeable audience in Latvia and beyond. Deep Baltic editor Will Mawhood recently had a chat with Jauja about what he sees in Riga, and what he has learnt from the project. How did you start the project? What was the impulse behind it? I work as an architect and I had to go every week to the other side of Riga. At the start I went by tram, and it took around half an hour. Then one day I missed the tram, but I still had to go there – I couldn’t miss that meeting. I went to this architectural site by foot – I hoped that it would be faster, so I went by bus, found a very straight route to the place – the building site. Then I discovered that I could go by foot even faster than by tram, because by tram I had to go to the centre then switch to another tram and then go to the site. So by foot it was faster. And originally was it just pictures from your route to work? Yes. If I am more specific, at that time I worked near Matīsa tirgus [market] – sometimes people call it Vidzemes market; it’s on Brīvības iela. I went to the other side of Riga – Maskačka [a slang name for the inner-city district of Maskavas forštate]. I went down Ģertrūdes iela to the railway, and then I went under the railway by underground tunnel – there is a pedestrian tunnel. Then I was already in Maskačka, because it is the centre, but when you pass the railway, you’re already in Maskačka. That’s a very interesting place, I think. Then I sometimes modified this route to be more interesting – I went along some other streets – then of course I discovered some new things. But I think if you look, they are mostly pictures from Maskačka or Ģertrūdes iela. Ģertrūdes iela is actually my favourite street for Paslēptā Rīga – there are many posts of things from this street; I always feel best when I am there. What is it about Ģertrūdes iela that you like so much? It is diverse – for example, at one end of Ģertrūdes iela there is a church. If you go from the railway side along Ģertrūdes iela, at the end of the street there is a church: it’s called Gertrude’s church [Rīgas Vecā Svētās Ģertrūdes Evaņģēliski luteriskā baznīca]. It always looks magic; it looks very good, but the other thing is just at the very centre near this church there is very, very richly decorated architecture, from the late 19th century, but when you go look out of the centre, there is this transition from this to more moderate and not so expressive buildings, and the quality of the environment is also not so good – the buildings aren’t in good condition; it’s a really poor area. But I always liked to see this contrast between different characteristics in different streets. I like these courtyards because the decoration from the street side is rich and diverse, it looks very good, but if you go into the courtyards – especially on Ģertrūdes iela – it’s rougher. You mostly present things like very beautiful, very ornate stairwells or doorways, but it’s very noticeable that they’re usually in quite bad condition. I think you see this as something beautiful, but someone could equally look at them and say “well, this is really sad, because they’re not being looked after”. Yes. I like them because when they’ve decayed by themselves, due to wear from people, over many years, they develop their own rhythm and their own life, and they look very complex – there is some dirt, but it’s not like just a dirty spot; it’s like layers of dirty things. And then it looks like a 3D painting or something like this. It’s very like an Impressionist painting – many layers, some transitions of colours. For example, on the facade: when you look closer to the ground, you can see that some dirt has come up onto the facade, and you can’t even see the exact border between the building and the ground – so it looks like a very, very careful painting that has been done over a period of twenty years. Because you told me when we met before that some people who comment feel that the page is intended to show the city government that these buildings are in bad condition, or something like this. You mentioned that you get a lot of sad faces in the comments on Facebook. Yes, these are usually people who have emigrated from Latvia – they’re the ones usually putting sad faces in the comments. Because it doesn’t fit with their beautiful memories of their city. But I think it’s just another way how things can be. I don’t think that very polished things are beautiful – it’s just a different way of being. What kind of things do they write, these people who have left Latvia? It’s usually just a sad face, and sometimes they even complain. “No, I cannot stand this, I will leave this page”. But I’m not looking for likes. It’s very noticeable that almost all the pictures come from the centre – and, as you said, also from Maskačka. Do you think there would be the possibility to do something like Paslēptā Rīga in the further out districts of Riga, which are mostly Soviet? I think it’s more connected to where I go on an everyday basis. Because I don’t go to those places especially. Only if I have some things to do there – if I have work there or need to buy something. A very interesting thing is these internet shops – they sometimes have their offices in strange places because for an internet shop, it’s not very important where it’s located. These places are very strange sometimes and then I also discover interesting routes, interesting places. But if you were going to Purvciems or Zolitūde [large Soviet-era housing districts in Riga] or somewhere like this a lot, do you think you would be able to find material? Yes, because I like how these old modernist buildings have also decayed. Because this concrete is also alive, and because no one washes these facades or paints them again with some new paint – they just leave them, because it’s communal. They own the building, all the people, and so nobody cares about it. And then it also decays in the same way. I found also in the centre one very beautiful decayed Soviet building. So I took some photos and I hope it will look good. It’s on Vārnu iela. It looks from the street more like a postmodern building from the late ’80s, but when you go inside you see that it is the same kind of block building as those built in the ’70s. From the street side it’s done more sculpturally, but from the courtyard it’s just a flat, modernist building. And it’s also decayed a little bit? Yes, it’s decaying, and I like the way the plaster looks. 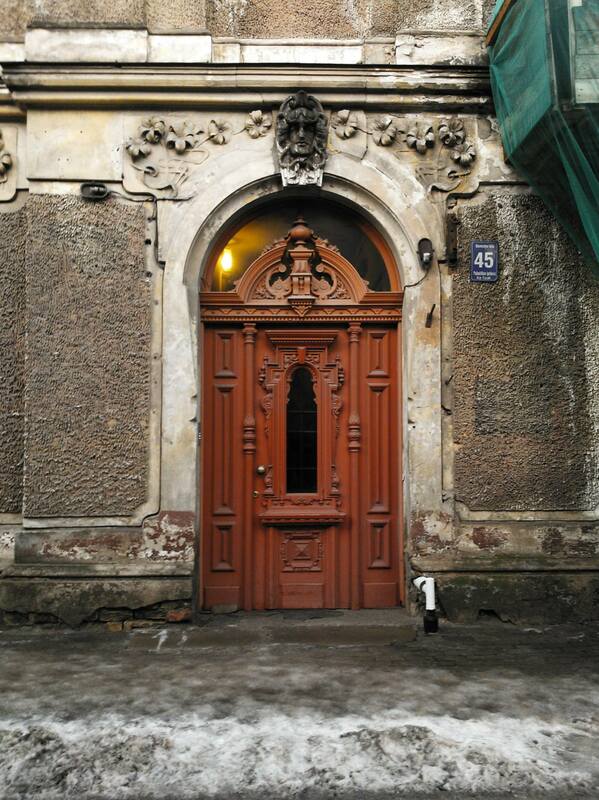 Do you think Riga is unusually rich in these kind of hidden sights, these kind of decaying beautiful places, or do you think you could find the same things in any city if you were looking? I don’t know. Riga is I think interesting because in the [city centre] streets we have these continuous planes of buildings, but then when you go into the courtyards, sometimes you see these older buildings which have not been destroyed – some small wooden buildings that maybe some hundred or more years ago were in the middle of fields. And the city when it was developing, it kind of ate the countryside with these new structures. But some things are left from the former countryside. So this is the interesting thing. The new city eats these old things, but some things are left, and that’s maybe also a special thing. I don’t know how it works in some other cities – maybe they just destroy everything, and put up new buildings. When I was in Budapest, I asked my Airbnb hosts if they could show me some really decaying places – because posh buildings are not so interesting to me. I went there and I also felt very good – I felt something a little similar [to Riga]. I think maybe in Paris, you could also find this. But the thing is in these Western cities, people maintain most things, and there aren’t these strange situations with different layers of history. At least I couldn’t find them in such places; everything is more in order there. You’ve already mentioned the buildings on Ģertrūdes iela – could you tell us a few more “hidden locations” in Riga that you really like? The walrus sculpture in Grīziņkalns – that is really one of the highlights. That’s at 15 Jāņa Asara iela – this building has a big courtyard; the building was built in the mid-‘30s and it’s an early modernist building – in Latvia we call it functionalism or Bauhaus style – and there is a sculpture of a walrus in the middle of this courtyard. The architect who made this building, Osvalds Tīlmanis, he asked the sculptor Rihards Maurs to make some sculptures for the buildings and for the courtyard, so it gave a very good touch to the place. I like the way the author with simple geometrical lines has added abstraction to the natural forms of a walrus. This is a great modernist sculpture of the late ’20s. I’ve always wondered about that – what the reason was: why was it a walrus specifically? I think in the middle of ‘30s, Latvian artists and architects were very happy that they could do their own things, and express themselves – not under Tsarist Russia or the Swedes or anything. They can make their own ideas, express their own feelings through architecture or sculpture. This sculptor is very good – he also did these sculptures on Ausekļa iela [in Riga’s “quiet centre”]. There is an entrance to the courtyard with a high arch, and there is a nightwatchman figure on the left side. Another place I think is very interesting to visit is – I don’t know if it’s still there, but there was one very interesting courtyard with a big painting on the wall. It’s a reproduction of a Latvian painting, but it’s scaled up and printed on this plastic material and it’s stretched over six floors, on the side of the building. It’s a Latvian painting – and a painting of Venice. It’s on Strēlnieku iela, number 15. But it’s open – it’s no problem to go there. There is a story about this. I met this guy who was the janitor of the building. I asked if he knew who did this painting – because nobody knows who made this print. It’s not from the city government; no one knows who did it. This guy said he knows who this guy is, but he cannot say, because he is a very well-known figure, and he made it for his future wife to look at from the window. But I don’t know if it’s true. The third recommendation would be on [Jāņa] Asara iela as well. There is a courtyard there and it was a place where they filmed a very interesting movie about Riga – it’s called Vārnu ielas republika [The Republic of Vārnu Street, a children’s film set around the time of the 1905 revolution – based on the book of the same name]. There the kids play or live in this courtyard – but they didn’t film it in Vārnu iela, I don’t know why – maybe because there are too many trees there. So they filmed this in another street in the same district. I went there a few weeks ago. because when you see the movie, you see this place, and it’s decayed even more, because the movie is from the ‘70s, I think – and nothing has been done to this courtyard, so it’s decayed more, so it’s even better, to my eyes. So it was meant to be the characters’ home, in the film? Yes. There was also this scene where this Communist fugitive is running from the Tsarist police, and this courtyard is the place where he is running to. And in one scene, this guy is running away, the Tsar’s police are chasing him, and then a woman throws some sand from high up in a building at the police. And the camera also looked up and you see one very elliptical window, and when I came into the courtyard, I saw also the same thing. You’re going into a lot of places that are kind of only semi-public: courtyards, stairwells, etc. What kind of reactions do you get from the people there? Usually I try to be as quiet as possible – when I see some people, I go away. Because during these visits, I don’t want to communicate with people. I just want to be quiet, to feel the place and then take a photo and go away. You’re not from central Riga yourself, are you? Do you think this gives you a different feeling about the buildings of this area from locals? Yes. I think locals – they hate the place they live. Or maybe not hate – but they are maybe not happy with the condition of these places. I was on one TV show, Te! (“Here!”) where we did some walks through these places. We walked with the camera operator, director and interviewer and spoke with some local people – I was talking about what I saw and what I like there. And they said “no, we hate this place – it is in such bad condition. On weekends we go to other places. It’s not good here”. My parents are from Riga. I lived in Teika [Riga suburb] with my parents, but for half of the year we went to the countryside. My grandparents, they had fields, animals, in Apserde, near the Lithuanian border. We went every weekend to help them, and in the summer I lived in the countryside. Maybe it gives me a different attitude to Riga, but I haven’t thought about it. Maybe after one or two years I will have figured it out, how it affected me. But then I got married and we moved to Ogre [a town around 30 km east of Riga], because the flats were cheaper, and we bought our own flat and now we live in Ogre. It’s a very good place if you have kids because Ogre is a really green city, great for walks and sports. Now of course our kids can stay by themselves, and now we can go to Riga for some entertainment. But mostly for me Riga is the place where I work. Could you do something like Paslēptā Ogre, or is there not enough material where you live? Sometimes it seems that there is a lot of this material everywhere – but for example even in Riga I cannot find this material so easily. It sometimes seems to me – “there is a decaying building. Just take a photo and it will be OK”. But it’s not like that – not every bad-looking courtyard is enough for me. When I come into the courtyard – OK, technically it could be good, but I don’t find this thing that I need. So it’s not actually so easy to find these strange places. But I thought that there could be a lot of these [Paslēptā] – perhaps in Ogre. But I think Riga is a very good place. Maybe in Liepāja it could also be – I’ve seen that some people are posting photos from Liepāja, and it feels the same [as Riga], I think. Maybe it’s these cities that have those five-storey pre-war apartment buildings, maybe there is some specific thing. And I think also in Rēzekne, perhaps. Such a pity – there have been no new posts on Paslēltā Rīga for some time. I post an occasional one on the page, but I do not think anyone sees them, so I do not bother anymore.